Hello, sewing fans! 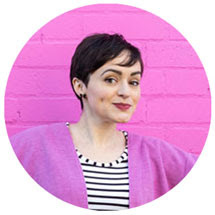 Lexy here, taking a look at the lovely things that you've been making for this edition of the Maker Gallery. It's been fab looking at all of your creations - here's our pick of the bunch! 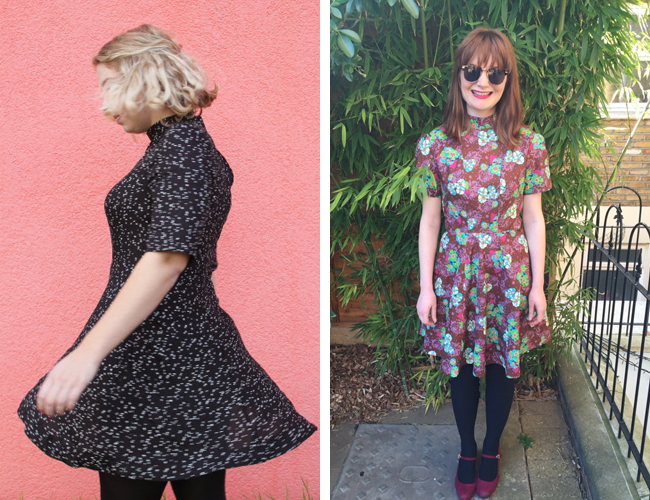 Hannah and Rosa have both tackled our latest sewing pattern, the Martha dress, with aplomb – and stunning results! Hannah’s gorgeous, swishy Martha has been created in a flirty mini length (and check out the bunny button on her blog! ), whilst Rosa has crafted a beautiful summer party dress, which we think will look beautiful dressed up or down. Both ladies will no doubt be wearing their gorgeous dresses for the Martha Instaspam party – will you be there? It’s not too late to buy your pattern and sew her up in time! Sarah and Kristen are channelling skirt chic this Spring, and have opted for a simple (yet effective) Dominique skirt, and a gorgeous adapted Miette skirt. We love how Kristen has moved the wrap to front, and replaced ties with button a closure. 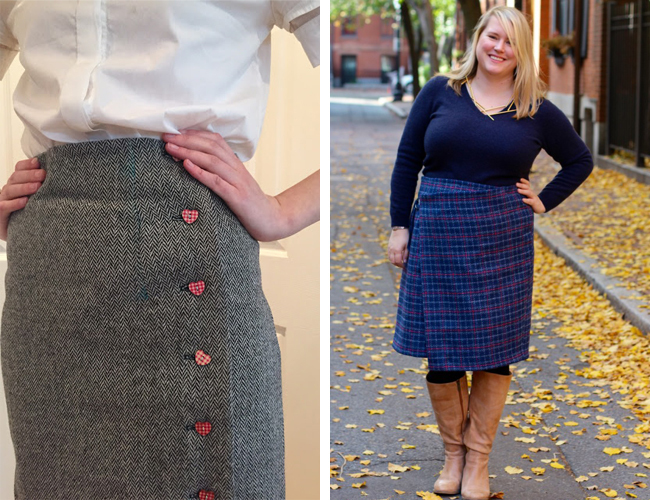 These skirts are perfect as we transition to warmer months, and are really easy to make, too. A fab place to start with any handmade wardrobe! 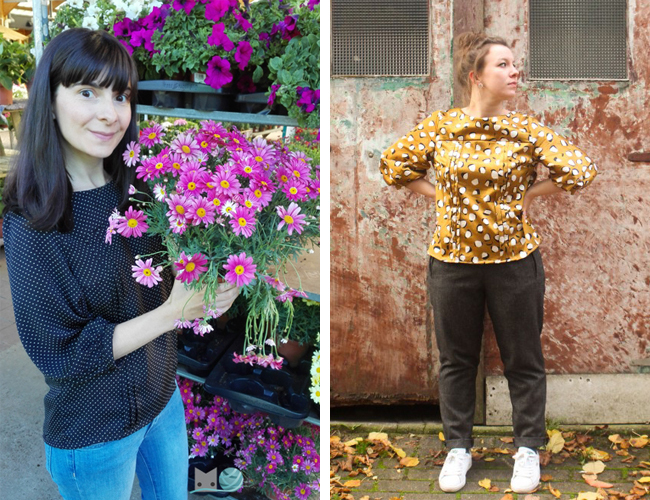 The Orla top is a versatile wardrobe piece, as Lucy and Becca demonstrate here. Lucy has made a lovely, cream-dream of an Orla (and Tilly and I were lucky to have a look at it when Lucy said “hello!” at a show in Birmingham! ), whilst Becca has made a cute and casual Orla shift top, without the collar. Two different interpretations, and they both look fab! 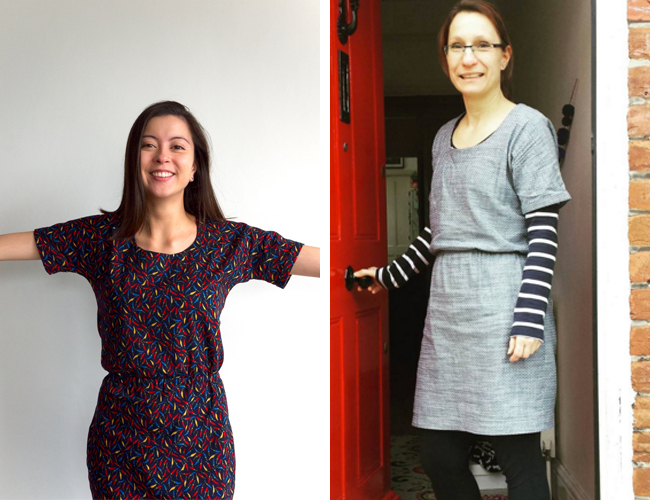 Is anything better than a comfy, flattering, easy-to-sew Bettine dress? How about one covered in chillies?! That’s exactly what Lisa has created, and we love it! We also love Michelle’s interpretation, especially when it’s layered with stripes. Did I mention that we love stripes? How gorgeous are these Fifi pyjama sets?! Britta has made a dreamy set, which would undoubtedly hasten her on her way to sweet dreams, whilst Rachel’s tropical Fifi will surely help her rise and shine in the morning! Fifi is a sweet sewing pattern, and it’s a really good one to do if you want to work on new techniques on a smaller scale (hello, French seams). 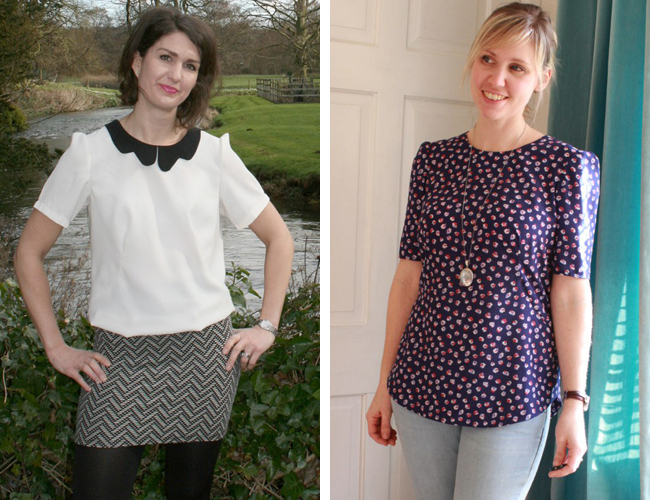 The Agnes top is a much loved staple for all of us here at Tilly and the Buttons – as I look around today, Tilly and Joanne are both wearing them! Big love to Melanie for wearing her heart on her sleeve (and her shoulder, her forearm, her collar bone…), and we love how Jacki is channelling nautical chic with her tiny anchor print Agnes. Ahoy! 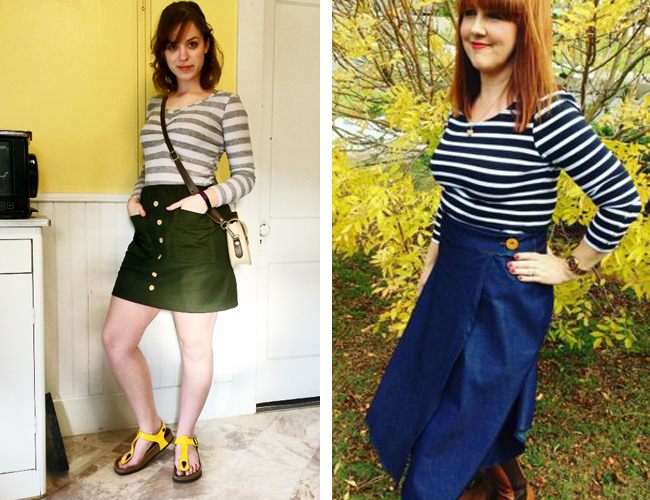 We posted a picture of Susie’s Arielle skirt on Instagram a while ago, and you loved it as much as we did! We just can’t get enough of those heart buttons! 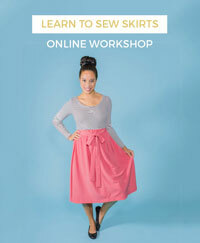 Jenny has made a gorgeous skirt by hacking the Arielle sewing pattern, and included D-ring closures. Head to her blog to read up on how she did it. Martina and Annis are sporting Francoise dresses to be proud of. Martina’s dress is party-perfect, and we love the collar embellishment. Annis’s Francoise is perfect for day or night, and who can resist a dress covered in flamingos?! These two ladies are ticking all the boxes in their cute Cocos. We’d be smiling like Rosie too if we had made that divine, sunny Coco dress! Cocol83 looks super chic in her Coco top – perfect with some cats eye sunglasses and red lipstick for a summer holiday, non? 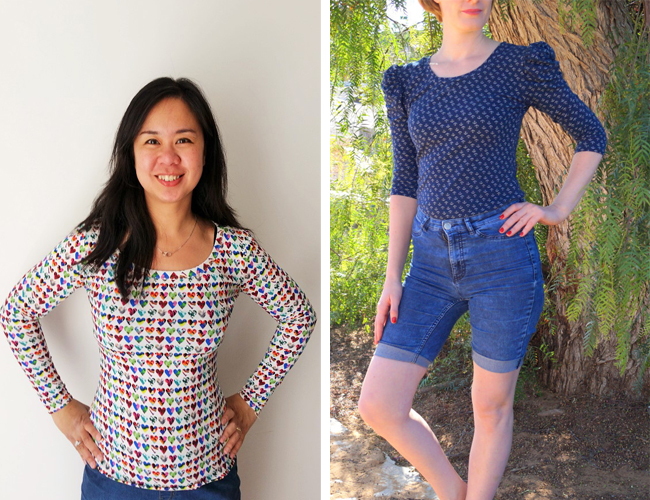 Mathilde is such a lovely top to make for summer: it protects your arms from the sun, but is still lightweight to keep you cool – and it looks gorgeous, to boot! Nati and Sarah have opted for different fabric types, and both look fantastic. And finally, what have you lovely lot been making from our first sewing book, Love at First Stitch? Plenty, as it turns out! Here are two makes that caught my eye recently. 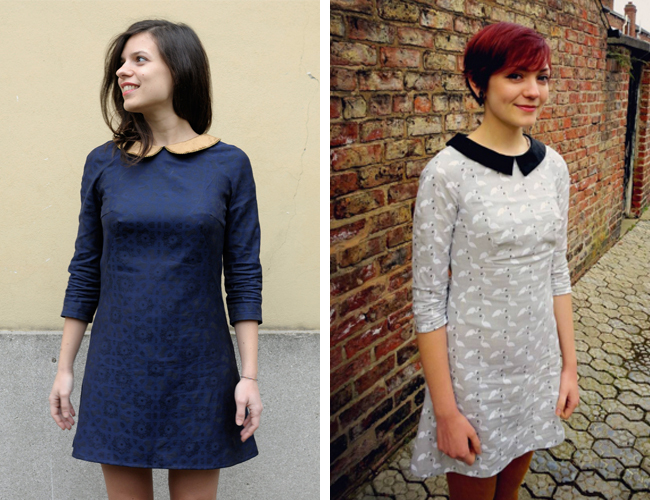 Caitlin has made a really sweet Megan dress that will no doubt get lots of wear in summer. 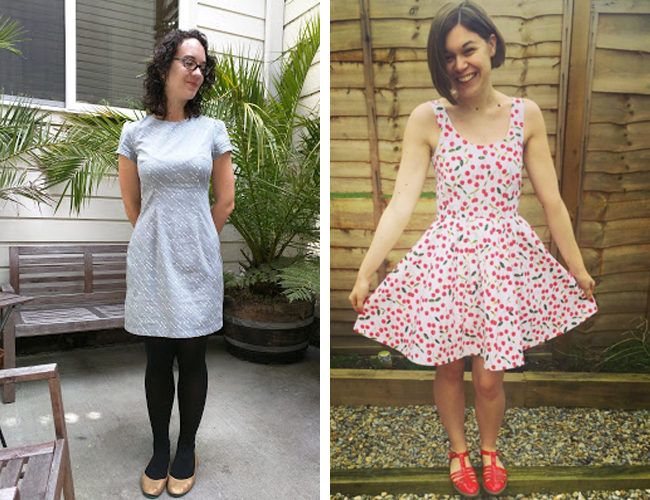 Ruth has made another dress from the book, the Lilou – and it’s covered in cherries! Summer dress perfection all round! I hope you’ve enjoyed seeing other people’s makes as much as I’ve enjoyed finding them. For even more inspiration, have a look at our Maker Gallery, and have a peek at what we’re up to on Instagram. Get in touch if you have a lovely make that you want to share with us, and don't forget to get yourselves ready for the Martha Instaspam party - it's sure to be a good one!